“Design, manufacturing and marketing of Insulated Solutions systems to maintain the cold chain throughout the process of storage, delivery and distribution”. Management promotes continuous improvement in the management system, bringing into play all the resources it deems necessary to strengthen these bases and the achievement of our objectives. 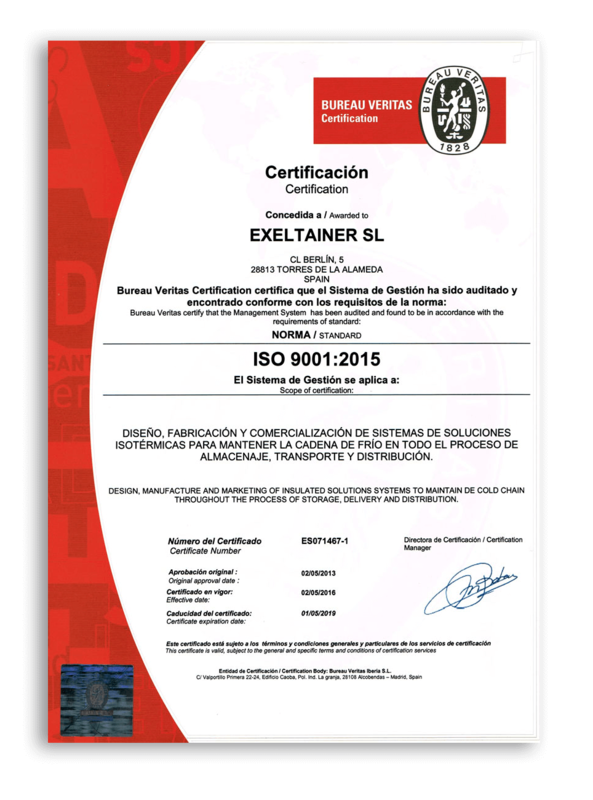 To adopt commitment of the compliance with ISO 9001:2015 Norm in addition to legal and regulatory requirements that may apply. The Top Management involves the whole staff on the maintenance and the continuous improvement of the Quality System. In the same way, the staff is steadily encouraged to carry out its duty to reach the highest degree of satisfaction to our customers. Maintenance and updating of our technical resources. The proper selection of our suppliers through objective criteria for evaluating their services. The continuous training of staff in their respective areas. A service offered with high added value, that is, capable of solving specific problems of customers in a personalized way.